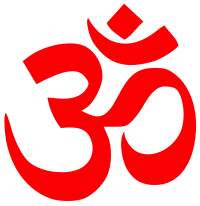 Om (also spelled Aum), is the most sacred symbol in Hinduism. Hindu scriptures tell many things about this symbol. In Hinduism, Om is like calling god's name towards you. This name is generally said three times, before chanting any prayers. Om is usually related to the Hindu God Shiva, who is the destroyer god. Om Shinrikyo is a Japanese new religion or cult. This page was last changed on 1 August 2015, at 22:51.